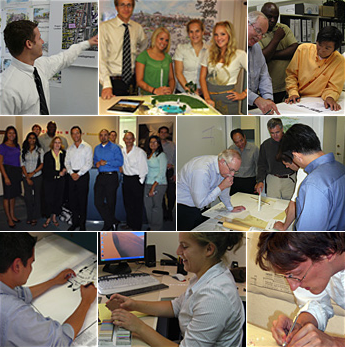 LCA Architects supports the professional development of all of our employees, including the Intern Development Program, mentorship and the pursuit of licensure. LCA is a well known and reputable firm that specializes in diverse projects including: schools, mixed use, estate homes, as well as a variety of other venues. We are listed as one of the Top 5 East Bay Architecture firms as well as in the Top 25 firms for Northern California, and Top 50 in all of California. Team building events let us express our creativity in a less technical way. 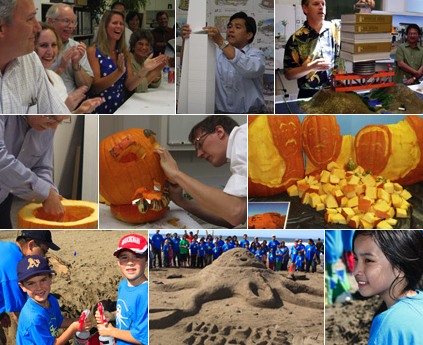 We have a good time embracing the unknown challenge: bridge building, high-rise design or the annual pumpkin carving contest with a twist. Friday breakfast spreads, project milestones and accomplishments, birthdays, weddings, babies, and the annual holiday party are all reasons for us to celebrate. Our staff builds camaraderie outside of the office as well. We’ve had fun at the beach participating in the Leap Imagination in Learning Sand Castle Classic and have organized field trips to museums, notable architectural sites and lectures. Running in the Big Sur Marathon relay, movie nights, bowling, and attending local events such as the opening of the California Academy of Sciences are additional ways we get to know one another outside of the office. LCA University is our in-house program that offers AIA continuing education seminars so our staff remains up to date with code changes. We have outside consultants come to our office to educate us about new architectural programs. Product representatives educate us about the latest products and technology so we can provide our clients with state-of-the-art and cutting-edge buildings. LCA is a member of the United States Green Building Council and we have developed an in-house training program to support our staff in becoming LEED Accredited Professionals. The LCA Library provides employees with study materials for the ARE Exams.